The Chicken and Mushroom Pie is a great comfort food for the family, especially during the festive season. Pie: Add a pinch of salt to the flour. Rub the flour and butter with fingertips until the mix resembles fine breadcrumbs. Work fast and do not over work the pastry. Add 3-4 tablespoons of cold water and form into soft dough. Wrap in cling film and chill for half an hour. Filling: A) In a medium-sized bowl, coat the chicken with flour and season with salt and pepper. In a saucepan, heat butter and olive oil. Once hot, add in the chicken and stir, and allow the meat to brown in the oil. Add potatoes and water to the dish. Then cover with a lid. Three minutes later, add carrots. Keep the lid on. Check to see that the potatoes and carrots are cooked, and then add celery and mushrooms. The celery and mushrooms are added in last so they remain crunchy. Season with salt, pepper and Worcestershire sauce according to taste. Once potatoes are cooked, turn off the heat. *It is important to note that the filling will go through a second process of cooking, in the oven. B) Pastry shell (makes about six pies for foil trays of 4”) Take the short crust pastry out of the fridge and roll out to about 3mm thickness. Use this for the base of your pie tray. Blind bake in oven at 170 degreees Celcius for about 10 minutes or until lightly cooked. C) Add filling to the pastry shell. 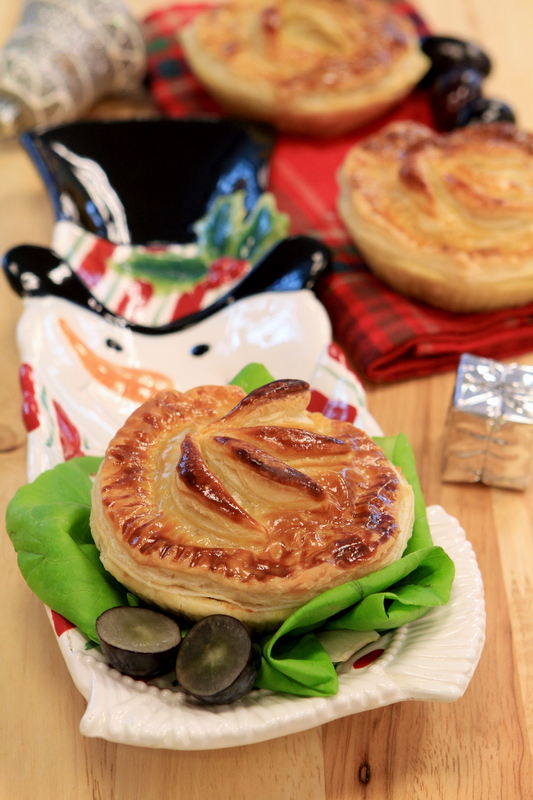 D) Take the puff pastry and cut out the desired shape to fit the top of your pie mould. The pastry must cover the sides so that steam does not escape from the pie. Cut out designs from left over pastry. Use water to help the pastry designs stick. Brush egg wash unto the pastry and then pop it into the oven. Bake until the puff pastry fluffs up and the top is golden brown.